Happy Thursday everyone! Sorry for the late post I was stuck at the day job training a new recruit. All my staff has gone back to school so I’m busy filling in all the shifts that they can’t work. The day that Team Stryker is successful enough that I can quit my day job I plan on getting a Team Stryker tattoo on my back. My plan is to slowly have the cover to Mission 001 on my back but we will see how painful just getting Team Stryker is. 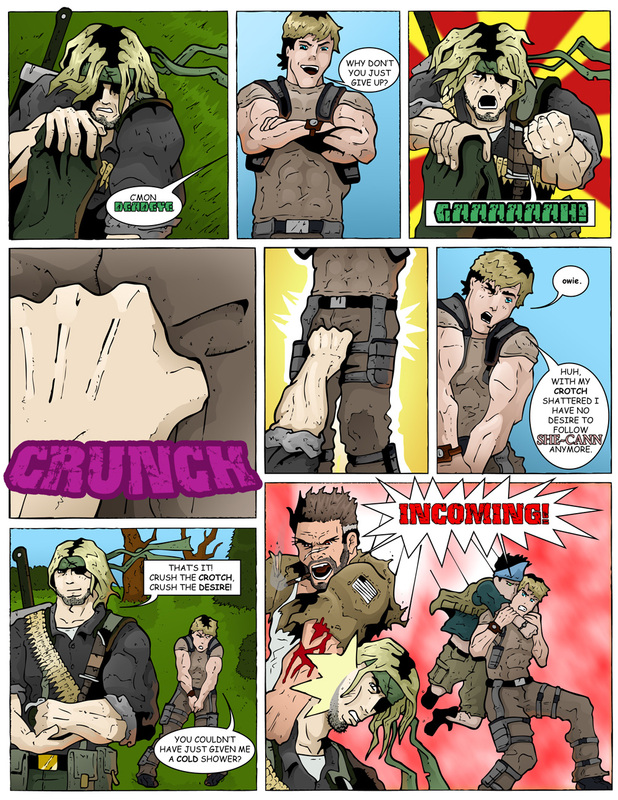 Today’s page was a fun way of setting up the ultimate battle when Team Stryker is literally torn in half and have to battle each other. I needed to find a way for Deadeye to break the Flirt-Stare of She-Cann and therefore break her hold over TS, and nothing ruins the mood than a swift punch to the groin (am I right guys?!). It was tricky setting it up to see that Deadeye had clearly punched Casanova, but I wanted it to be a little vague as to where he had just been struck. The panel of silence is that feeling all guys get when they have been hit in the swim suit region where there is a moment of clarity before the blinding pain kicks in. While I’m sure this isn’t the first time Casanova has been struck in the twig and berries, it never gets any easier. Have a great weekend everyone and come back on Monday to see what happens when Casanova and Deadeye take on V-Scope and Eagleheart! Lmao! This page is hilarious! Brilliant! I didn’t even know what could break Pretty Lady’s spell. A groin punch will certainly do it!